Salem Design and Manufacturing is recognized as an industry leader in eddy current and nondestructive testing applications. Since 2004, we have designed and manufactured a large range of nondestructive testing solutions for applications in bar tube and wiring, eddy current, ultrasonic, and vision systems. The markets we serve include utility, military/defense, OEM/industrial, rail, farm, ranch and specialty applications. 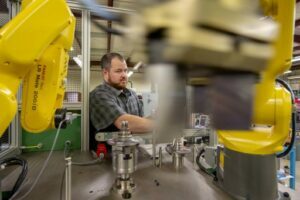 Our mechanical and electrical engineers are experienced in the design and manufacturing of customer machinery for nondestructive testing, material handling, and manufacturing process. Our highly skilled personnel utilize the latest 3D CAD / CAM software and electrical engineering software for creating machines and electrical controls. Along with our modern manufacturing facilities, these capabilities enable us to handle complete projects entirely in-house. We are a supplier of “Turn-Key” systems which are supported in the USA. We strive for total involvement with our customers by working in close cooperation to define the requirements and scope of their project before beginning the job. 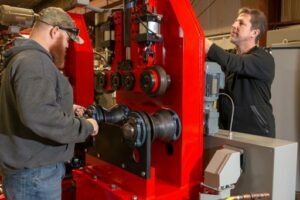 Through this working partnership, we develop and build machinery custom designed for one-of-a-kind applications for which standard equipment is not available from any source. On every project, we remain keenly aware that our machines must be the best that can be created because they fill essential functions in our customers’ businesses. In an effort to offer “Turn Key” solutions, we integrate instrumentation from the world’s leading manufacturers of Eddy Current, Gauging, Vision and Ultrasonic instrumentation. Salem Design & Manufacturing leads the way in presenting new solutions and building innovative machines for manufacturers across the country. We look forward to serving you to help your business be the best in your industry.